Wealth creation was the theme of the Lausanne Global Consultation I went to in Chiang Mai, Thailand a few weeks ago. As Director of the Lausanne Global Classroom, I interviewed a number of conference attenders to get their perspective on the wealth creation. The purpose of the interviews is to include them in an episode of Global Classroom on Wealth Creation for Holistic Transformation. 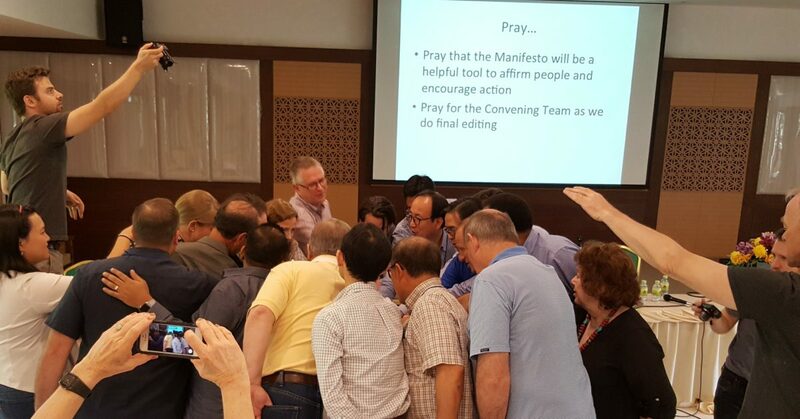 The picture shows the participants praying over the statement they made during the consultation. What a joy and privilege to be part of this important event! This Global Classroom will be used to help young global leaders in the church gain biblical perspectives on wealth creation, and learn to fight poverty, address justice issues, and be more effective in ministry. You will be able to view the episode online in a few months at lausanne.org. One of the people I interviewed had an incredible story. He was a doctor in Ethiopia. He grew up in a poor Christian family, but someone provided a scholarship and he was able to go to school. After he became a doctor, he started his own clinic. The clinic eventually became the largest and best hospital in Ethiopia. He also started a university to train doctors, nurses and workers for the hospital. In addition, he owns farms and other businesses to supply the needs of the hospital and university. From one poor boy, God has created incredible wealth to bless thousands of people! Many people now have good jobs and are able to support their families as a result of this kind of wealth creation. God gives the ability to produce wealth (Dt. 8:18). I heard many other stories like this in Chiang Mai. Pray that God will use the statement from the Global Consultation to encourage and equip churches and leaders around the world in understanding and implementing wealth creation as a means of impacting communities for Christ holistically.